So I know I talked about the weather in my last post but OMG you guyyyyyyyyyys. My house just about blew away yesterday. I felt like Dorothy in the Wizard of Oz. True story. We had the most insane winds allllllllll day long and it was AWFUL. Worst wind I’ve ever seen. I mean, I’m talking the kind of wind that takes down trees and power lines. It was down right dangerous and it lasted for hours and hours, which was super annoying. But thank goodness we survived and the Colorado Cyclone of 2018 is in the past. I’m extra glad we made it through because today’s post is one I’ve been looking forward to for a couple weeks now! 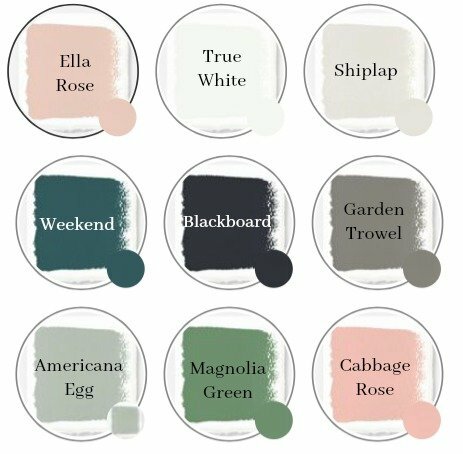 I’m sharing a full overview of the Magnolia Home chalk-style paint colors. (Cue the jazz hands.) As you might already know, this chalk paint is now sold at Target, and it’s also available online, which is awesome because that means it’s finally easily accessible for all us DIY painting addicts. HECK YES. I absolutely love this chalk paint for lots of reasons, you can check out my full review here to see why, but I think the best part of all is that it comes in 44 beautiful colors. I thought it would be fun to share a little looksie at the five colors sold in Target stores, as well as all of the 18 shades that are available online. 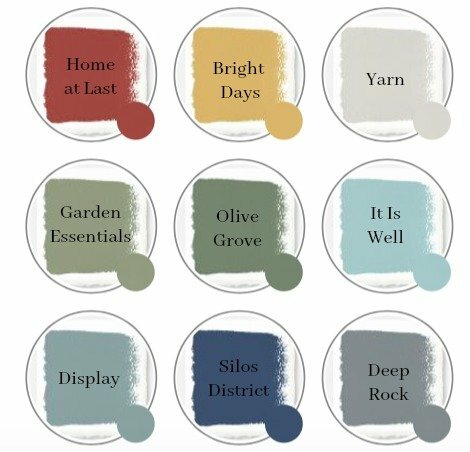 I even painted some super glamorous samples for you guys, so I hope this helps if you’ve been curious about the paint colors! All righty, so just in case you’re new to the Magnolia Home Chalk Style Paint, let me give you a super quick overview. 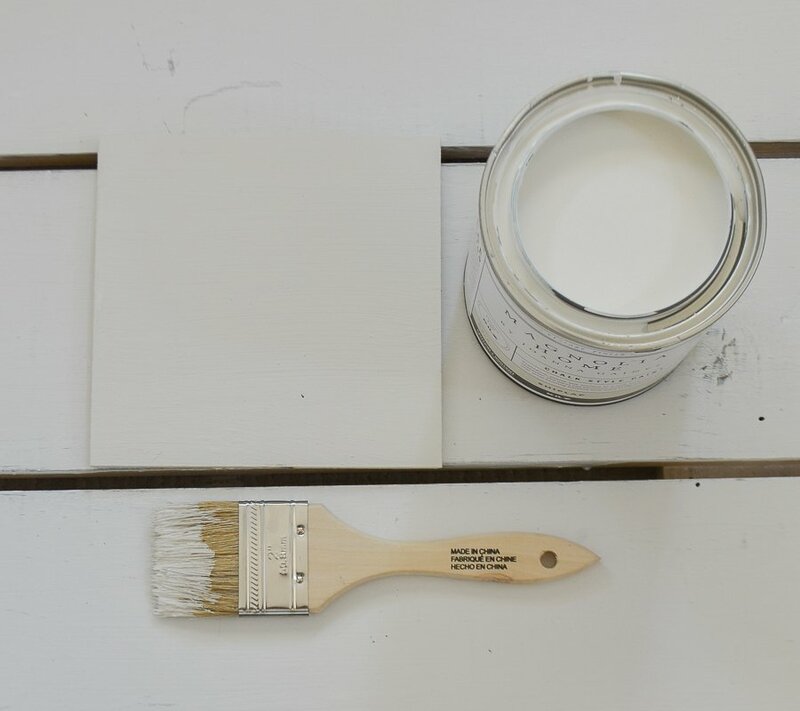 So chalk paint is typically used for painting furniture, but you can use it for all kinds of fun things. It’s easy to apply to a variety of surfaces, including wood, metal and even concrete. 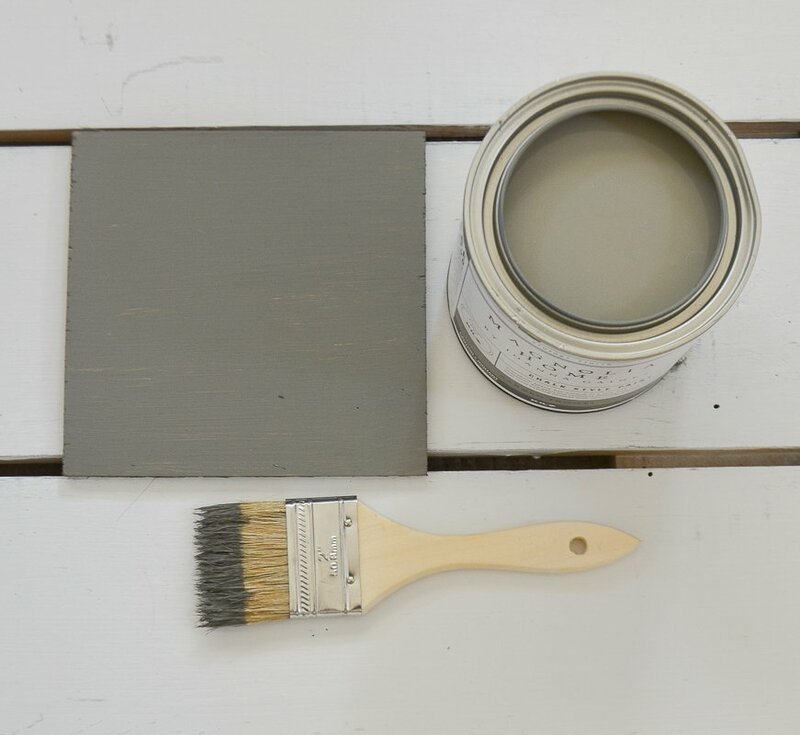 I’ve used chalk paint many times now and love how it’s not too thick and heavy (compared to the uber popular Annie Sloan chalk paint) but it’s still very pigmented, which makes for great coverage with less coats of paint. It’s basically the bomb and you can use it to transform any piece of furniture with little to no prep work. Ok, let’s take a look at the paint colors sold in Target stores! Olive Grove: Earthy green with natural hints of hazel. I looooooooove this color! Weekend: Denim inspired blue that is vibrant, bold and quite peppy. Shiplap: A creamy weathered white. Perfect for all the things. 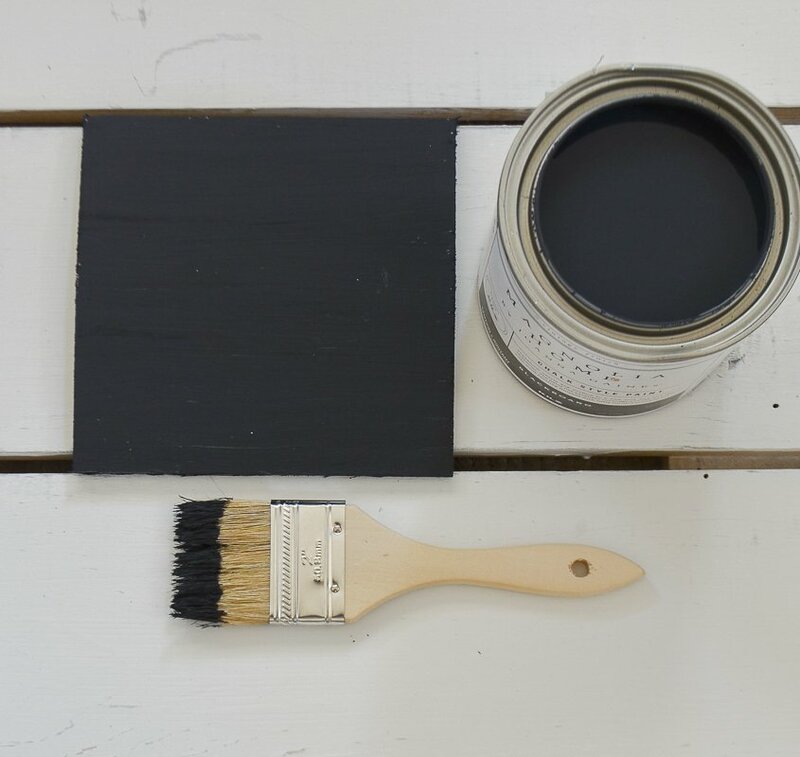 Blackboard: A rich, dark black with hints of deep blue. Garden Trowel: Earth toned gray accented with olive green and cocoa. GORGEOUS. I was surprised to see the finishing wax is also carried by Target. They have both the clear and the dark wax, which I shared all about in this post. 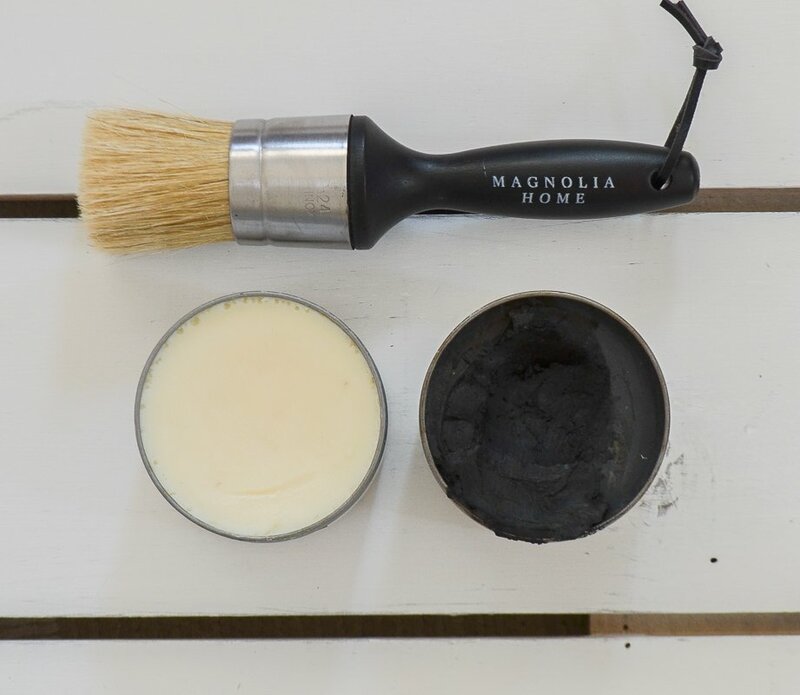 This stuff is really great and it is the perfect way to seal any piece of furniture that is done with chalk paint. It’s super easy to work with too. The clear wax is awesome if you want to keep the paint color as is, but the dark wax is used to give more of a vintage, aged look. 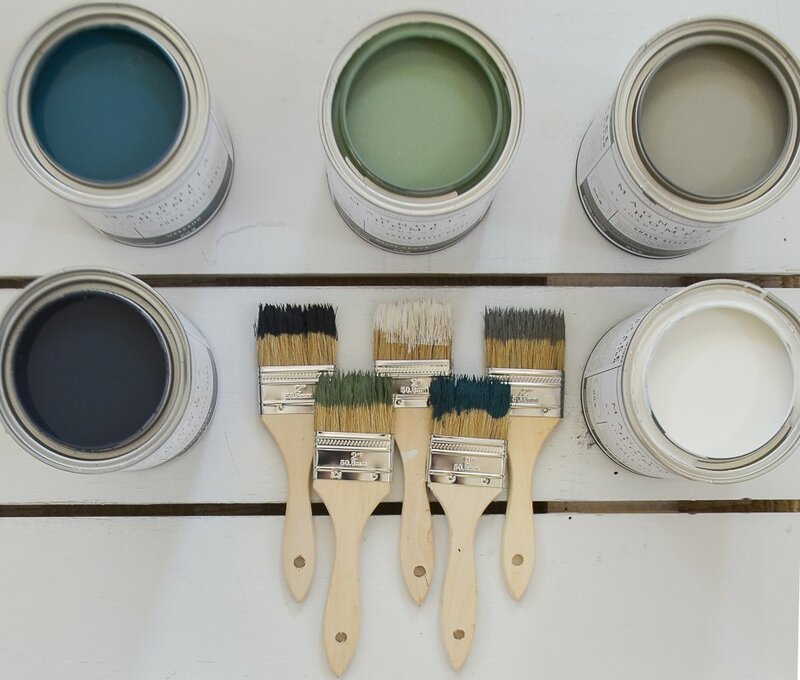 Well I hope this look at the Magnolia Home Chalk-style paint colors was helpful for you guys and maybe inspires you to take on a new DIY project. And I’d love to hear what you think of this paint if you’ve tried it out! 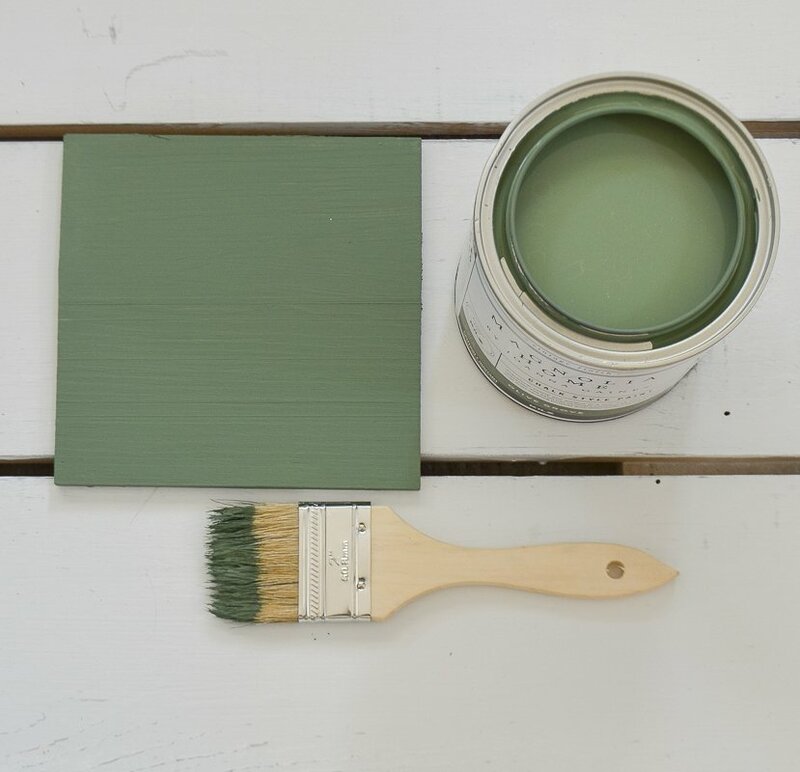 I’m actually working on a little furniture project right now with the color Olive Grove and I can’t wait to share it. And let me tell you, my husband is thrilled to see that I’m using a color other than white! Hmmm I’ve never heard of that happening but I guess it’s possible. Personally I probably wouldn’t worry about it…I’d say the chances of a brick randomly falling out are pretty slim! THANK YOU! I am finishing up the last coat of paint on my loft today (jazz hands) and was planning on chalk painting the cabinets tomorrow …but when I went to my local stockist for ANNIE SLOAN, they don’t carry it any longer….NOOOOOOO!!! I decided to try the Magnolia line, but was undecided on a color!! This helps a ton!!! Thank you, dear!!!! This post was PERFECT timing for me!!! Oh yay!! I’m so glad this post was good timing for your Dena!! What color did you decide on?? Great post, Sarah. I really love the Olive Grove color. I need to find something to paint that color!! Right?! I love that too. Such a fun color, especially for spring. Can’t wait to share what I’ve used it on! I’m disappointed they don’t have a true Navy in the line. 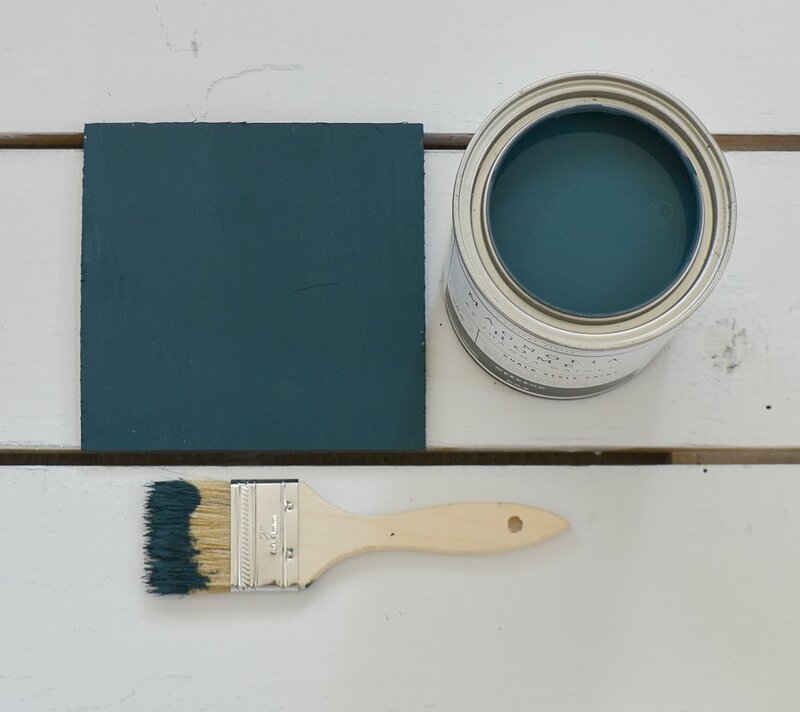 I am having the hardest time finding Navy in any chalk paint line. Do you know of one? I like some of her other colors though. It just seems with a black that a Navy shouldn’t be that hard to produce and would be a lot more popular than a deep yellow or some of the other colors. Oh well. Thanks for the review. I love your blog! I think you can get the Rust-Oleum chalk paint tinted to whatever shade you want at Home Depot! Just buy the white and they should be able to tint it for you. I haven’t done that personally but I’ve heard of several that have! Ooh, all the colors are so lovely. 😍 I’m a chalk paint newbie. Could I use it on outdoor wood furniture? It would live on a porch, but will get the the occasional blowing rain and will be exposed to heat/humidity in the summertime. Yes definitely! I’d just recommending foregoing the wax and using a clear polycrylic instead to help seal it from any water damage! I’m getting ready to paint my bathroom vanity, should I use polyurethane top coat to ward against water damage? Hi Mary, I highly recommend a clear polycrylic to help protect against water damage. Don’t use wax! Can’t wait to try one of these new chalk paints! I wonder if the brushes are cheaper than Annie Sloan’s? Anyway, glad you didn’t end up in Oz yesterday…LOL. My best friend that lives in Monument told me today that you had huge wind yesterday and how it’s so bad for the fires down south. I think the brushes are a bit cheaper than AS, although I can’t say for sure because I haven’t bought an AS brush in so long! And yes, the fire danger here is crazy right now. We’ve had such a dry winter and this wind doesn’t help anything! Hi Sarah – I’m preparing to paint my dining room chairs and your tutuorial on chalk paint is amazingly helpful! The chairs are currently black and I’m now going with a creamy white and am thinking chalk paint willl give me the best coverage. I’m planning to use a paint sprayer for the job; fingers crossed! Thanks so much for all the information you so generously share! Hi! I’m going to do my dining chairs too, and wondering – did you use the sprayer with chalk paint or brush? How did it turn out? I’d love to do with sprayer but haven’t read much about doing it for chalk paint. Sarah, I wanted to share a picture of a lamp I just purchased. It’s right up your alley and I couldn’t wait to show it to you. Please let me know if this link will work for you. I bought 2 lamps and have one on each side of my sofa. I just love how it looks! I love olive grove, I used it on a little dresser I’ve had for twenty some years! I used the hearth and hand knobs, gave it a new life! So I purchased the weekend color in chalk paint at target and went straight home to paint my bathroom vanity. I really love the color and how easily the paint went on, and how quickly it dried. I then applied the clear wax to seal and protect, but I ran into a problem. After completing the project a couple of tiny drops of water fell on the cabinet door and caused the paint to discolor. Now I’m worried that this will be a complete fail since this is a bathroom vanity that my children will use and for sure will have an occasional splash of water. Not sure why this is happening. Does the wax take some time to cure? Can I paint over it with poly or is it too late since I already applied the wax? Can I remove the wax without destroying the paint underneath? I am also frustrated with my chalk paint vendor. I am working on a table in memory of my father-in-law and father who were in the military. I decided to paint the top of the table a school house red and the bottom a bright blue. The blue paint color I selected, however, has been discontinued. I really like the Silos District blue from Magnolia Home, and was wondering if you had ever used it. Also, can you add water to the paint to do a wash finish?